The above shows the third of a series of three integrative diagrams on Cosmic evolution by Erich Jantsch. In his book The Self Organizing Universe, Jantsch, an astronomer and futurist influenced by systems theorist Illya Prigogine, unifies the various fields of science and human knowledge in a single evolutionary framework. 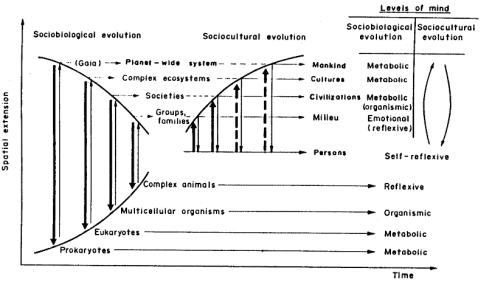 The above diagram, entitled Socio-Cultural Evolution, continues the same events and processes shown in the previous diagram (socio-biological evolution), which are also shown at the left in the diagram above. Here evolutionary emergence and the growth of complexity now occurs at the social, cultural, or civilisational level. This is the most subtle of the three evolutionary stages (matter, life, and mind so to speak), because here there is an inversion or self-reflection, by which the micro-scale evolution now becomes macro-scale evolution. Evolution now takes the form of the culture, human society, and the transmission of knowledge from one generation to the next (equivalent to Dawkins' memes). At each further macro-level, the microcosmic individual is linked first of all to families (the last link of the previous diagram), then to societies, larger cultures, and finally planetary consciousness. MAK110008. (diagram copyright, Erich Jantsch, Pergamon Press).